In the US it is already popular for ages. 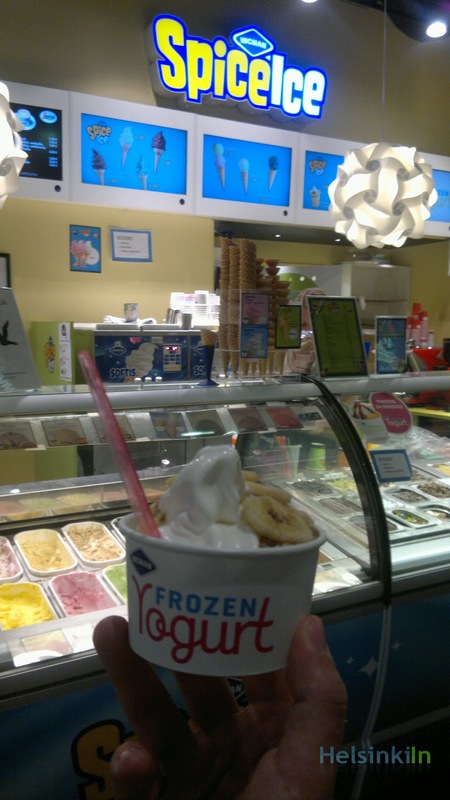 Now Frozen Yoghurt is also sold in Finland. At Spice Ice you can now get the ice cream alternative. It is produced from yogurt and milk and doesn’t contain crème which makes it less fat and calories which makes it a bit healthier than regular ice cream. Its yogurt taste makes it a refreshing treat for a warm day. At Spice Ice you can choose between two different – unfortunately not really that cheap – sizes for either 4.50 € (small) or 6,10 €. The small portion comes with two the big with three toppings (they have quite a nice and big variety). And if you are not really that keen about frozen yogurt, you can of course also just stick to the good old ice cream (they have soft ice and balls). P.S. You don't get Frozen Yogurt at all Spice Ice shops yet. But you can definately get it at Kamppi and Itäkeskus. If you're into frozen yoghurt, you must visit Yobot! http://www.yobot.fi/ Check it out, if you haven't already. :) Much more character than in Spice Ice.